It's pretty crazy to think that this record came out five years ago and it's been that long since Marvelous Darlings released a record. I'm not sure why they split up, but man do I miss them. This is the pink vinyl version of their singles compilation. I'm kind of surprised it was still kicking around all of these years later. When this album was originally put out, Deranged listed a black vinyl version and a blue vinyl version, which I bought right away. A few weeks later they listed this pink version and I was just never willing to commit the crazy Canadian postage rates required to pick it up. Fast forward a few years and Deranged started offering a cheaper shipping alternative for the folks in the US, so I picked this up while ordering another record. 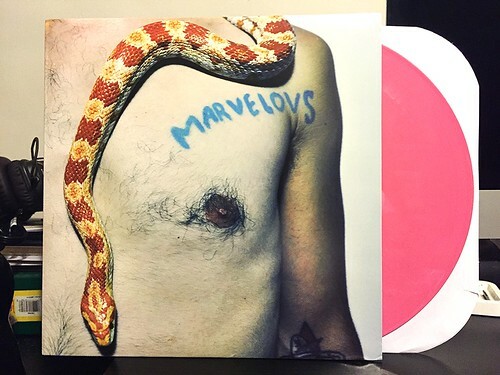 There are only a few bands that I really go variant crazy for, but Marvelous Darlings is one of those bands. This LP is a collection of every 7" that Marvelous Darlings released over their active years. The way this band combined a rock and roll swagger with some of the biggest pop hooks you've ever heard was something to hear. It's been especially weird to watch singer Ben Cook's other project Young Guv go off the rails with his first full length after releasing a slew of 7"s and then just kind of go dark. The torch is still being carried a by Marvelous Mark who is crafting some awfully nice pop tunes, but even those are missing some of the crunch and fervor that Marvelous Darlings were able to capture. Single Life ends up being a picture perfect document of a band that was together for a few years, wrote some of the best damn songs you've ever heard and then vanished into the night. It's a pretty essential record if you ask me. What I wouldn't give for the band to do another.